The Heightfield command creates a NURBS surface or mesh based on grayscale values of the pixels in an image file. A grayscale z-buffer bitmap generated from 3-D objects by the ShowZBuffer command. 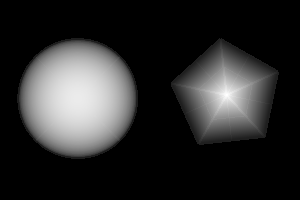 The mesh object created from the grayscale z-buffer bitmap by the Heightfield command . The base of the surface will be parallel to the current construction plane. Pick the second corner or type a length. The shape of the pick rectangle will match the aspect ratio of the image file. The image's "height" is sampled at the specified number of control points along the u and v directions of the image. Sets the scale of the height of the object. Uses the image as a render texture for the created object. Evaluates the color of the texture at each texture coordinate (u,v) and sets the vertex color to match. 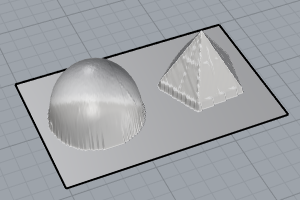 Creates a mesh with vertex points at each of the sample locations. Creates a surface with control points at each of the sample locations. Creates a surface that passes through each sample location's height.